The wide, glistening stretch of Vatulele Island Beach is situated near beautiful coral reefs and some of the country’s most luxurious accommodation. Build up buy super white, soft sand are the finest attributes when you wade ashore barefoot from your seaplane. While the island is 31 square kilometers in area, not more than 1,000 local people live here giving this idyllic island destination an air of exclusivity. There are a couple of luxury resorts, bungalows in this beach too. This is considered one of the most high-end island in Fiji. A slice of heaven is perfect for a quiet getaway where you can leave the hassles of civilization behind. The long, white sand beaches offer turquoise blue water, beautiful scenery and several nearby resorts. The perfect beach for relaxation, it is fringed with tall palm trees and offers striking views of the surrounding mountains. If you’re after something slightly more adventurous, then the beachside resorts offer everything from diving and snorkeling activities to kayaking and boat rides. Diving has been the most popular activity in this island. Apart from a little isolation, the coral reefs and wildlife, are some of the things that someone should check out. A rare gem of Fiji. 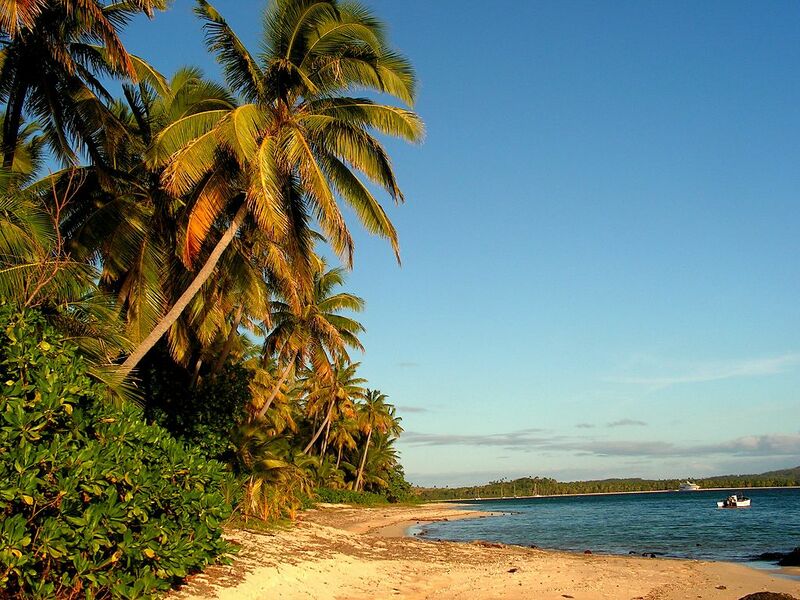 Natadola is Located about 30 minutes outside of Nadi, this is the best beach on the island of Viti Levu. Its stunning natural setting is a major draw and a perfect place to relax and take in the beautiful Pacific scenery. With its consistent waves and inviting water depth make this an ideal spot for swimming and snorkeling. While the beach is mostly undeveloped there are resorts that are starting to appear, but for now, the beautiful white sand beach is relatively undisturbed. This is ideal for beach bumming and ultimate solitude. You can even camp out if you want to! Home to the most famous of all the Yasawas’ beaches, the Blue Lagoon. Crystalline and glossy, it doesn’t disappoint to every type of swimmers, snorkellers, divers, and people on cruise boats or yachts who dabble in its gorgeous, lucent depths. Actually, it’s not dissimilar to many of the lagoons scattered around the Yasawas. The snorkelling here is still rich though, as many travelers go in and out of this island, some coral reefs has died already. This is quite secluded and is situated near the Nanuya Island Resort is known for its lovely natural setting and crystal clear waters. Services and facilities provided by the resort create an idyllic South Pacific setting where visitors can choose to lounge in a beachside hammock among the swaying palm trees or take advantage of the many water sports activities available including kayaking, diving and fish feeding. In the settlement of Enadala that’s in the eastern side of Nanuya Lailai, the beach here is buffeted by strong winds. Connecting the Blue Lagoon and Enadala beaches, and snaking over the mass of gently sloping hills of the island’s interior, is a well-trodden track. A nice trek and a bit of would be nice! It takes about 30 minutes to walk from one beach to the other by using this track or following the coastline at low tide. Located near the village of Rakiraki, Volivoli Beach displays a beautiful wide lagoon with a stunning view towards the island’s mountains. Swimming is difficult on many beaches during low tide but the deeper waters at Volivoli offer great swimming while snorkeling is popular along the coral reefs. Savor the beach with the nice view of the mountains that offers one of the best sunsets. The nearby Volivoli Beach Resort offers affordable accommodation and many beach activities to enjoy. Set on the tranquil Volivoli Beach, there is an upscale dive resort is surrounded by jungle, and lies 5 miles from Dolphin Island and 7 miles from the quaint, seaside town of Rakiraki. They offer cozy rooms that has an amazing ocean-view balconies, and come with free Wi-Fi, desks, and tea and coffeemakers, as well as en suite bathrooms. Some include extra beds, while modern suites add living areas with 2 pull-out sofas.